Eastfield House Lodge is a charming two bedroomed cottage (sleeps 4) set in secure private gardens, offering a peaceful and relaxing atmosphere for those seeking a break from modern pace.The building has been recently converted to a very high standard - it is well insulated, double-glazed and centrally heated (under floor heating on the ground floor). Free wifi is available. On the ground floor, you will find a fully equipped kitchen (including food processors/mixers and Nespresso coffee machine) opening onto a spacious dining area, a sitting room, shower room and utility room (with washing machine, tumble dryer, ironing equipment). From the dining area, stairs lead to the 2 bedrooms - one with ensuite shower room, the other with a vanity unit. Each room has 2 single beds which can be made into a Super King size bed according to preferences - all bed and house linen, toiletries, bathrobes & slippers are provided and there is a hair dryer in each bedroom. We provide a lot of basic items, such as coffee capsules, tea, sugar, dishwasher tablets, kitchen and loo rolls, cleaning products, hand soap and toiletries. The cottage enjoys a secluded position with lovely views over the lake and large garden - guests are welcome to use the family tennis court. 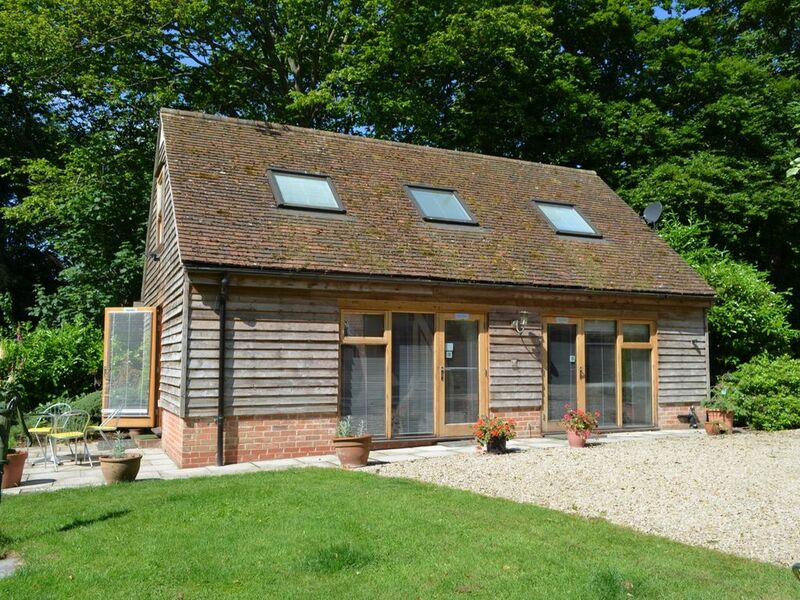 The property is located in the attractive and ancient village of Longparish in Hampshire. The village has a pub and a shop/PO. Ideal for a relaxing, peaceful break/holiday with the added attraction of a comprehensive choice of beauty and spa treatments available in the main house, just across the drive. The property is very easily accessed via the B3048, from the A303/M3 and A34 dual carriageways, offering good communication E-W & N-S to Winchester or Newbury (20min), Salisbury (30 min) and Stonehenge (25 min); London/Heathrow (45min-1hr), Southampton Airport (40min), Portsmouth channel port (1hr); Whitchurch/Andover railway stations (15min) - offer good connections to London Waterloo (1hr). My name is Bénédicte – I was born in Geneva (Switzerland) where I lived with my family until I married Roger, my English husband, and moved to the UK in 1989 - we have one son who presently lives with us and a (very spoilt!) friendly black Labrador. Roger also has 2 sons from a previous marriage and 5 lively grandchildren. In 2003, I refurbished a house I owned in the French ski resort of Les Carroz, into 3 apartments and rented them out through Owners Direct. I really enjoyed making sure people had a good time and we had lots of repeat bookings; however, the distance made things a bit heavy to manage after a while so the property was sold eventually. During that period, I also trained as a beauty therapist and image consultant and started working from home. Roger is retired but very active and busy - he helps a lot with everything. He is passionate about flying, motor racing and sailing and has written 5 adventure novels with a new one underway. We fell in love with Eastfield House and the area when we first visited it. Despite needing a lot of work, both the house and the garden instantly felt like home. We liked the seclusion and rural feel that gave the impression of being remote - yet so easy to access - being able to get to Heathrow in just under an hour was a real bonus. Longparish village is beautiful with several bridges over the River Test - famous worldwide for fly fishing - and lovely walks in the surrounding countryside. Over the years, we refurbished the house and outbuildings and improved the garden and decided to offer Eastfield House Lodge and The Studio Loft apartment (in another outbuilding) for holiday/short term breaks, like we used to do in France. Eastfield House enjoys a very peaceful location yet is so easy to access - it is totally secure in a gated property, with ample parking space, and offers total privacy whether you are staying in The Lodge or The Studio Loft. The central position of the property makes it an ideal base for visiting numerous places of interest in central southern England. The Studio Loft was recently refurbished, fitted with a fully equipped kitchen and comfortably furnished - turning it into a light and airy apartment with total privacy. Finally, staying at The Studio Loft or the Lodge offers the added bonus of being able to enjoy total relaxation from beauty and spa treatments in my home salon (mosaiquebeauty.com) just across the drive in the main house. Ground Floor: shower room with large cubicle, toilet, washbasin, shaver socket, mirror, cupboards, heated towel rail. First Floor: ensuite shower room with large cubicle, toilet, washbasin, mirrored cupboard, shaver socket, heated towel rail. Surrounded by beautiful countryside, but very easy to access. Longparish is a picturesque Hampshire village, built along the River Test, featuring various styles of architecture and a beautiful old church dating back to the 13th century. The River Test, famous worldwide for trout fishing, is just half a mile away. Oil central heating - underfloor heating on the ground floor, radiators upstairs. Pure cotton bed linen from John Lewis and The White Company. Luxury Hypnos beds. Additional duvets and blankets available in cupboard. Bosch washing machine with a selection of programmes including eco-programme, wool/silk and delicates. Bosch tumble-dryer with a selection of programmes. Free ample secure parking (gated property) in front of property. Free wifi provided through mobile device - please note that it is NOT UNLIMITED and ONLY for checking emails and browsing/shopping. You are welcome to come in the main house to download large files. All towels are provided - 1 bath sheet, 1 medium towel per person, hand towels hanging by basins, plus a selection of mini hand towels. Tea towels and kitchen towels provided in kitchen and utility. Living room: 3-seat leather sofa & leather chair, rug, bookshelf and étagère. Satellite TV, DVD player, Radio / CD player, Coffee & Lamp tables plus lamps. Concealed Safe. Neff large (90cm) touch-control ceramic hob with fan extractor over. Neff microwave-combination oven. For safety reasons, please note that we ask this oven be used solely as a microwave. Comprehensive range of dishes, pots, pans and cookery utensils. Dining area with round table. Glazed cabinet (with light) housing table mats, coasters, glasses, salt and pepper mills etc..table cloths can be provided on request. Eclectic mix in English and French. A small selection of toys available but a lot more (for boys only, sorry!!) available in the main house, please feel free to ask! Patio area on the side of the cottage - a real sun trap in the summer! Fishing (River Test), shooting (by arrangement), numerous local golf courses, motor sport and flying (Thruxton). With regret, wheelchair access is not possible due to the nature of the building. Notes on accommodation: Eastfield House Lodge offers comfortable accommodation in a very peaceful and relaxing setting. Very easy to access from any direction, it is an ideal base for exploring many places of interest in central southern England, but also for those needing somewhere to stay on a short term basis. A comprehensive choice of beauty & spa treatments is available in the main house, just across the drive. Free wifi available. Outside: Small private patio in a sun trap (yes, we do get sunshine!) with lovely views over lake (with fountain and occasional wild ducks) and the 13thC village church in the distance. Extensive lawns, lined with trees and shrubs, and a paddock. Outdoor furniture available (summer). Tennis court. Ample secure parking in gated property. Utility Room: Washing machine, tumble-dryer, s/steel sink, overhead airer, steam iron, and ironing board, storage cupboards. Cleaning / Towels / Linen / Maid service: All bed linen (100% cotton), towels, tea towels, bath mats supplied. Cleaning carried out prior to handover. Additional cleaning available on request at additional cost. Other: Dining area: extendable circular dining table / six chairs, two arm chairs and two bar stools, glass fronted oak cabinet, large rug, lamp table + lamp, hanging / storage cupboard, high chair, removable safety stair gates. Stairs to 1st floor. My family and I spent a wonderful New Year break at Eastfield House Lodge. Set in a lovely rural location with beautiful grounds (watched over by Jumbo the Lab) it was everything we wanted and more. The lodge is modern, comfortable and well equipped with everything you need for a short or longer break. We enjoyed a New Year's Day walk into the village of Longparish, with its thatched cottages, where we had a drink (or two) in The Cricketers pub. Our hosts were extremely accommodating and helpful. We hope to return in the not too distant future and spend more time exploring. Thank you Benedicte and Roger. An excellent property for a short term stay, it was well equipped and furnished. The location is excellent in a beautiful area of the Test Valley. It is in easy striking distance of Winchester and Salisbury. Thank you for staying with us, recently, and for your kind comments. It has been lovely to meet you and we are so happy that you liked The Lodge and had a great time visiting the area. Wonderfully equipped with everything you need -- Nicely decorated -- And in a beautiful spot. Thank you for your visit and kind feedback. It has been lovely to meet you and we are delighted that you had a great time in The Lodge and enjoyed discovering the area, which has so much to offer. We had a fabulous stay at the Eastfield House Lodge. We found it easily with the detailed directions provided in advance. We found the place spotless with more than enough room for our family of four to recover from our flight from the US. Our hosts were so gracious and brought us breakfast groceries since we woke to unexpected (and uncharacteristic) heavy snowfall. It was a perfect location with a quaint pub nearby with delicious food and tasty pints. We would absolutely stay here again and highly recommended it!! Thank you for staying with us and for your kind review - it has been lovely to meet you and your family. We are delighted that you had a great time and were able to enjoy the (unusual for this time of the year!) snow. We wish you a great stay in the UK and hope to have the pleasure of welcoming you again some time in the future. 2nd sty at the Lodge and still a feel-at-home experience ! All you need for a perfect break in the countryside, in a comfortable extremely well-equiped place. Thank you for staying with us again, it has been lovely to have you and your family back! We are delighted that you like the Lodge and look forward to welcoming you again next year. Lovely cottage with everything you need. Thoroughly enjoyed my stay. Would certainly go back again. Thank you for your recent visit and feedback - we are so glad you enjoyed your stay in The Lodge and would be delighted to welcome you again in the future. - Relaxation : a comprehensive choice of beauty therapy and spa treatments together with image consultancy sessions are available in the main house in my home based beauty salon just across the drive (mosaiquebeauty.com). - Lymington (and ferries to Yarmouth on the Isle of Wight) 43 miles - all about 45 to 1 hour's drive. - Jane Austen's House Museum - Chawton/Alton 23 miles. - West Quay shopping centre 25 miles. Andover - 5 miles: for supermarkets, pharmacies, banks, leisure centre, golf courses, hospital (Not A&E). Local shop in village with Post Office. One pub, with restaurant, all about 1 mile. Booking Notes: We will email you our own booking confirmation with a full set of terms and conditions, after you have booked (either automatically through the website, or over the phone). No damage deposit asked; we trust you to treat our lovely house like your own! However, in case of accidental damage or loss of keys/gate opener (can happen! ), we will ask for reasonable compensation. Arrival times from 17.00 to 21.00 hours. Departure by 11.00am. Changeover Day: Flexible changeover day. Arrival between 17.00 and 21.00 hours. Departure by 11.00am. Notes on prices: The cottage sleeps maximum 4 guests, however, we'll accept 1 extra small child (up to 8yrs) for whom we will provide a comfortable mattress and proper bedding and towels for an extra £60.00 per period of 2 to 7 nights.